Across various articles now I've raved on about how the iPad makes things a bit more fun than they are on a laptop or PC. 6 months in it still goes everywhere with me and I regularly surf, email, work, play games and read books whilst loving the fact that the battery will last and I don't have to wait for it to start up. But a lot of the time, I'm pretty lazy. I'm as happy as anyone else collapsed on the sofa with the TV doing all the work providing me with entertainment. Around the house, there is only the one TV so I started to look into the possiblity that the iPad could do the job in other rooms. For example it's tiny (for a television) 9.7" screen is perfect for a few programmes at the breakfast bar in the kitchen and when I'm in bed thinking about catching 'The News' before sleep again, it could replace the need for a dedicated set. So one afternoon whilst laid up with man-flu I decided to check out each of the ways I could watch TV, either live or on-demand from the comfort of my bedroom. Please note that my experiences were based on the iPad being connected to a 10Mbit cable broadband connection over a fast wireless network. Okay, now in some ways this is not television. Although in the UK, you can watch programmes from both Channel 4 and Channel 5, you're not allowed to on mobile devices, and unfortunately the iPad falls into this catagory. That said, you could spend the rest of your life watching YouTube videos and never get through their entire library! Apparently a staggering 24 hours of video is uploaded every minute! To be fair, most of it is utter rubbish, but there are plenty of videos of cats doing cute things and movie trailers to make it worth your attention and hopefully the proper professionally made programming will eventually follow. Google are known to be experimenting with bringing movies to the service - so who knows? One day it could be the only TV platform we ever need! Both YouTube and the iPad are perfectly capable of displaying beautiful, high definition video. However videos are only ever as good as the quality of the source, and as most come from cheap home camcorders, don't expect to be amazed on a regular basis. That said, lookup an official HD version of a music video or movie trailer and you should find the results pretty impressive! The BBC iPlayer had a rocky start. It took years to develop and cost an absolute fortune. The end result was an unfriendly bloated mess, but the concept was a very good one. All the BBC's radio and TV output from the last seven days available on demand. Back at the start you had to download the whole program and watch it back later - which few could be bothered to do and the BBC went back to the drawing board. I do wonder, given the bad start whether there was even a thought that it might get dropped, but thank goodness they had another go, because the latest result is a triumph! Although on a PC you can still download shows (for offline viewing, say on the train), you can now also stream each show on demand over the internet at the moment you want to watch it! The interface is fantastic and the picture quality is superb given the current constraints of the internet. The iplayer for iPad is accessed using the browser and the iPlayer site will serve up a specially customised website for you to hunt down and watch your favorite programs. Unfortunately downloading to watch offline is not currently possible, but streaming over a wireless broadband connection is a pleasure and the ipad can deliver a real TV experience compared to laptops with their constant interruptions from other programs. My only slight criticism is that, on some programmes at least, the lip-sync appears a fraction of a second out, but hopefully this is something that will be remedied in time. You can get to the iPlayer from your ipad by opening 'Safari' and navigating to 'www.bbc.co.uk/iplayer' or click on this link. iTunes is one of the most convenient ways of getting TV onto your ipad. The iTunes app on the iPad is extremely slick and glossy and makes hunting down TVs and movies a pleasure. Many shows have free trailers, so if you're experimenting with something new, you can get a feel of it before you buy. However, particualar attention should be paid to the last word of the above paragraph. Buy. Downloading TV off iTunes is expensive. Movies can be rented and represent reasonable value for money given the convenience over visiting a DVD rental store, but TV shows cost around £2 each! The TV programmes download to the ipad and are yours to keep, but it's going to cost you a lot of money to build up a decent collection. On the upside, the picture quality is top notch and really shows off the iPad's screen and an occasional purchase like this, perhaps to pass a long journey, isn't going to break the bank. Note that rentals are time limited and you'll only have 24hrs to finish once you've started a film. Sadly TV cannot be rented at this time. In some ways I've cheated so far. The article heading is how to watch TV. Strictly speaking, when people think of TV they mean live broadcast television. What I've been describing up to now is really just 'video' - but on demand programmes are arguably more suited to a portable platform like the iPad than live TV. But, if you want to, can you watch live TV? Well, fortunately YES! Simply open your browser and go to www.tvcatchup.com or ipad.tvcatchup.com (either will get you there, but the latter one is direct). You'll need to sign up for a free account and occasionally when you switch channels, you may have to watch an advert, but otherwise this service is pretty handy. All the main five are there including most of the BBC channels and the Channel 4 line up including Film4. The only downside is that the picture quality is not amazing. 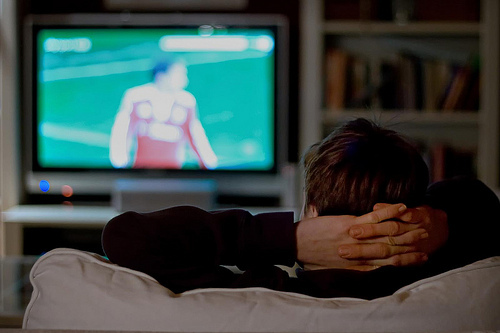 For watching a sitcom, or the news, generally things are fine - but anything where the action is fast moving, for example a sports match, or a car chase scene, then be prepared for some picture breakup. It definitely won't replace a dedicated TV in a room where you intend to spend hours watching, but as a 'fill in the gaps' solution, it's absolutely fine.